Home Tech Talk Programming Augmented Reality - mixing the virtual with the real. I'm pretty interested in augmented reality. Someday I would like to dive into this area more. Here are some of the resources and papers that are of interest to me. augmented reality to augmented virtuality. What is the best fiducial? Open Scene Graph - object oriented framework for OpenGL. reacTIVision is an open source, cross-platform computer vision framework for the fast and robust tracking of fiducial markers attached onto physical objects, as well as for multi-touch finger tracking. MenuBar.en - NyARToolkitCS - NyARToolkitCS is an ARToolKit built with 100% pure C#. It is derived from NyARToolkit for Java. This module uses no native code. I've been asked many times what I think augmented reality will be like and what it is...at this point it is a little fuzzy. Think of augmented reality as the fusion of real life with computers. Augmented reality will create displays for the user to peer into the real world and fuse digital information into that world. What good is augmented reality? Well using this technology we will be able to replace our normal vision with computer vision. Some day there will be VR google that display camera input in realtime to the user. So that when the user moves their head they get a realtime update of what the CCD sensor senses. The eye and the camera will be calibrated and the computer will enhance and warp the image to correct for any lense distortions. So it is already cool that we can correct for bad vision using a computerized vision system. But is really gets cool when we start to integrate computerized data with your normal everyday vision. For example, lets say you want to start taking classes at a university. You would look up how to contact that university online and get contact information as well as digital maps of the university for your augmented reality computer to ingest and process while you are at the university. Now when you call the university, (using your augmented reality computer with wifi video sip phone) your AR machine can position a picture of the person you are talking to, of where you are on campus. You literally will have a heads up display for life. Think about it, if you could build a computer to recognize faces, you would never have to remember names ever again. The computer would already know the person and label the person in your perspective. Very neat! I know it sounds a little out there, but here is some research that suggests we are closer to this than you might think. 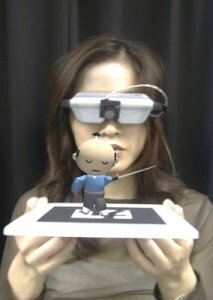 Development of an Augmented Reality system using ARToolKit and user invisible markers. HandVu - vision based hand gesture interface. Picture Cube: create 3d paper cube from pics. Control using haptics and gestures. MS is giving away some code which would be neat to leverage... it allows you to control the PC using a webcam and colored markers. Touchless SDK - Release: Touchless 1.0 - multi touch open source using DirectShow. CHAI 3D - an open source, freely available set of C++ libraries for computer haptics, visualization and interactive real-time simulation. CHAI 3D supports several commercially-available three- and six-degree-of-freedom haptic devices. Dan's projects page - a lot of great work related to haptics.